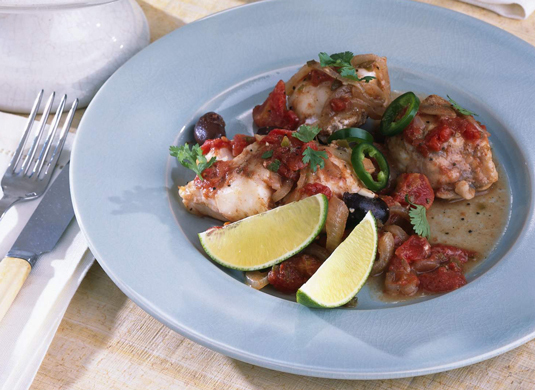 This tasty dish from Mexico features firm, white fish in a tomato sauce that is spiked with garlic, chiles, cumin, cinnamon, and black olives. Serve it with rice or flour tortillas for a delicious meal. Heat the olive oil in a large skillet over medium heat. Add the onion and cook, stirring occasionally, until the onion is translucent, about 5 minutes. Add the garlic and jalapenos and cook, stirring, for 1 minute. Add the cumin, cinnamon, and cloves and stir for 30 seconds. Add the tomatoes, black pepper, lime juice, sugar, and olives. Cover partially and simmer for 15 minutes. Add salt to taste. Add the fish to the sauce, spooning some sauce over each piece. Cook over medium heat until the fish is white and cooked through, about 8 minutes. The sauce should be gently bubbling; adjust the heat if it’s too high or too low. Garnish with cilantro before serving. Per serving: Calories 149 (From Fat 60); Fat 7g (Saturated 1g); Cholesterol 28mg; Sodium 203mg; Carbohydrate 6g (Dietary Fiber 1g); Protein 17g.